Lake District Osprey Project; Where is Number 14 Two? 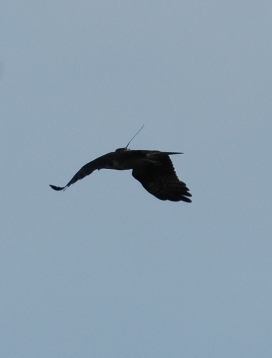 It may not be a brilliant picture of an osprey! Has visited over thirty countries in the last two years. Was hatched at Bassenthwaite on June 12 2013. 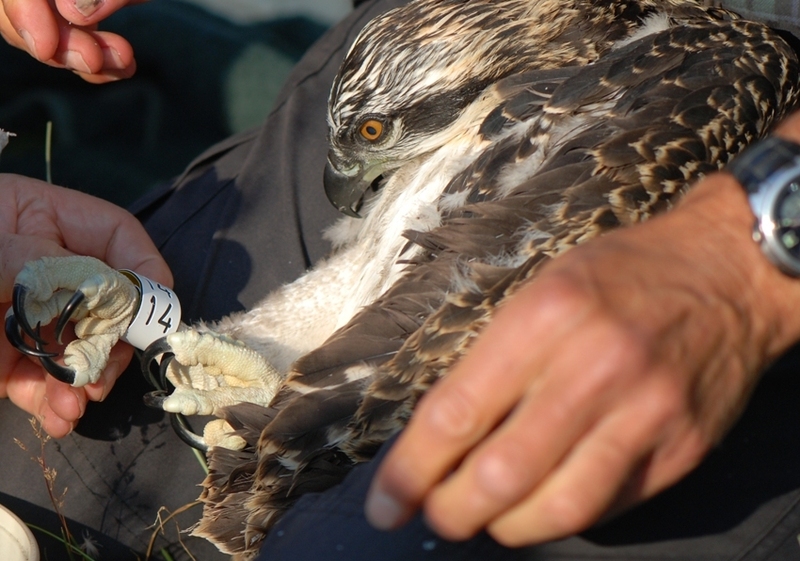 Was ringed and radio tagged in July 2013. Was photographed over the River Eamont,near Brougham Castle this morning at 8.05am. No, not a brilliant photograph but what a brilliant bird! Like most younger siblings V1 (Oscarina) has been following her brother V0’s (Gale’s) escapades with intensity. Anything he can do she would like to do too. So, although still a bit on the small side and, counting from lay date, 6 days younger, she decided to make her first jump just two days after his flight. Unfortunately, again like many aspiring younger siblings, her efforts to ‘keep up’ did not meet with quite the same success. With slightly shorter wing feathers and less time to practice sustained flapping her first flight was more of a glide and skimming just above the willows and the marsh, she landed up on the river bank. Not a good place if you then find you can’t quite get airborne again! Luckily for her, watchers at the viewpoint could see her clearly – and as time went on it was decided that she should be checked out in case she had injured herself. Our ringing expert and vet went quietly over to where she was sitting and without demure she allowed herself to be picked up and examined. Nothing wrong with her at all! So, to give her the right idea they perched her up on a nearby tree branch. Since then, although not whizzing about in the same way as V0 she has been holding her own. Unring and KL have, of course, been keeping a good eye on her as well and Unring has made sure that both she and VO have been fed fish. Hopefully, a few days more growth, and a gain in muscle strength will soon have her chasing VO down to the Lake. Before reaching the cynicism of adulthood where a combination of bitter experience and a pragmatic knowledge of physics dry up the wellsprings of belief, we all of us know, deep within our hearts, at a most basic level that we CAN fly. If you have ever bounced or jumped from your bed, pushed the swing to its limits and then leaped at the zenith of its height, or teetered on the diving board before the stinging splash down you will understand the absolute conviction that it should be possible to soar instead of drop. Years and the accompanying accumulation of bruises put paid to this notion and the most we can do is suspend belief with Superman or in extreme cases take up base jumping or buy a wing suit. 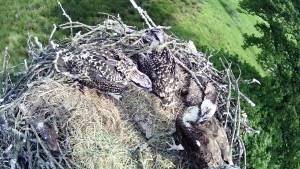 Watching our osprey chicks on the big screen at Whinlatter in the week before their take off rekindles the fire for flight in a mix of awe and jealousy. In their innocence they share our first convictions that flight is possible – every move they make , every time they rest, every mouthful of food they eat inextricably leads to one goal only – to defy gravity and fly free of the earth. And for them it is true. They drive the air with metre span wings over and over again, strengthening muscles and heart. Fierce predatory eyes gaze beyond the confines of the nest, planning routes, not just linear as ours are, but with depth and height combined, The ambivalent forces of anticipation, fear, desire for the unknown pulls them into higher and higher jumps, talons clutching at safety of their stick home and wings beating as a release from it. Then as the breeze lifts Gale (V0) lets go. This is what 55 days of growth was leading to – flight. Excitement mounts as both VO (Gale) and V1 (Oscarina) look towards the skies (and everywhere else of course) and throw themselves into the gruelling ‘get fit’ regime that is essential if they want to succeed in going up the thermal elevator and not plummet ignominiously to the basement..
VO, being larger and stronger than V1 is inclined to take up the practice space, with wings that span well over a metre. He is developing the upper torso muscles with increasingly rapid flaps – V1 has to duck, weave and lie down at the bottom of the nest to avoid being slapped about the beak. Yesterday, after balletic hops back and forth across the width of the nest he managed a vertical jump with toes scraping the overhead camera, and then frantically scrabbling back to clutch onto sticks and safety. V1 spends a lot of time staring hard at land marks around, working out distance and dimension. Unring has been bringing up plenty of fish, often still with their heads on and pretty lively so that the chicks have a chance to subdue their prey in the safety of their own home – this one a nice pump perch. 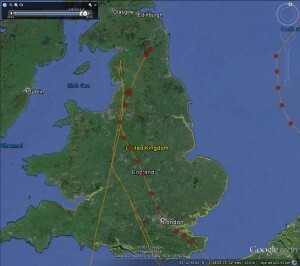 Over the last few days we have been seeing a 3rd bird in the area which KL has screamed at and Unring has chased away. Maybe No 14? – but we have not been able to spot a ring number. Lake District Osprey Project; Where is Number 14 ? Having crossed Cumbria at the start of the month near Kirkby Stephen and Warcop Number 14 continued towards the north-east of England to just south of Kielder Forest – visiting his cousins maybe? 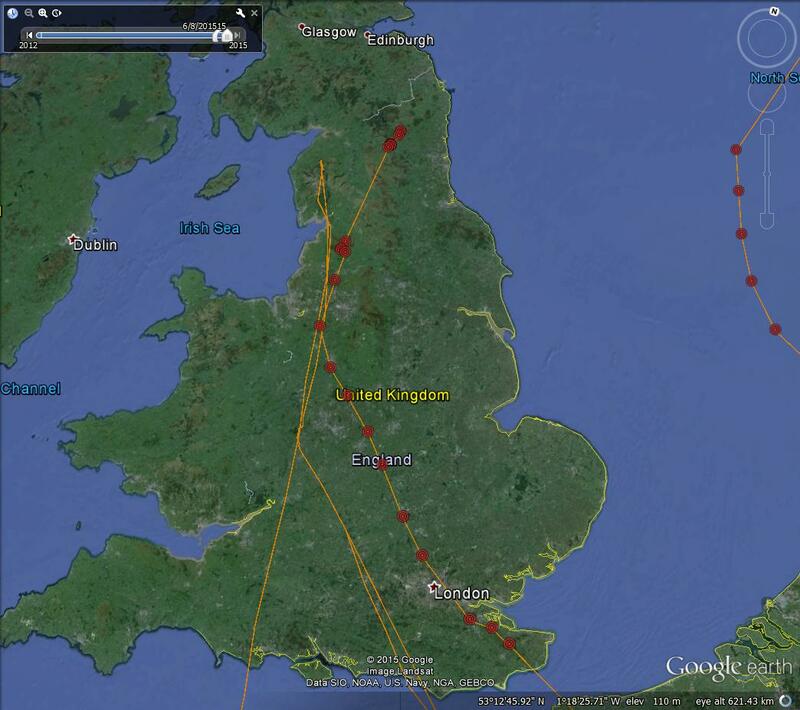 – he then crossed the Scottish border and flew west, returning to Cumbria once again via the Solway. From the 5th to the 9th he was in the Cockermouth area, taking out a few hours to visit mum and dad on the marsh – Sunday evening 20.00 in the ‘diamond field’- he then continued his Cumbrian tour to Millom and Grange on the 9th roosting for a night or two in Lancashire. Over the last few days he has had the good sense to return to Cumbria and signals have suggested he was in the Langdale area before moving to the north-west of the county. Any sharp eyed fishermen, photographers etc who see him or can even get a photograph do let us know – the giveaway is a small aerial on his back and/or the ring with Number 14 on it! Early in the morning of June 30th the Lake District Osprey Project team met at the roadside to check that all was in order; the tree climber checking off his ropes, Roy examining the satellite tracker, the equipment for weighing and measuring popped in the knapsack – don’t forget the rings! And most importantly, the Licence, issued to permit the team to approach the schedule one nest for this one-off occasion only. 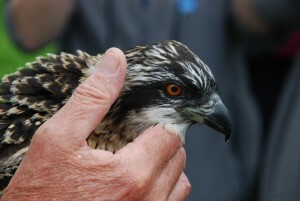 The Bassenthwaite Osprey chicks were to be given their “MOT” and have their identification leg rings fitted. Within minutes the climber was up by the nest, well secured, with carry bags in hand. The chicks obeying their parents and staying motionless were placed carefully in their bags, clipped to the pulley rope and lowered down to those on the ground. Everything was set up ready for the first measurements to be taken, wing and tail length and width of tarsus. – all about right for their age. Feathers skin and eyes looking really healthy. Then weighing, The oldest weighed in at 1000g .The colour ring Blue V0 was placed on its right leg. The metal BTO ring with its unique serial number was placed on its left leg . The second chick, four days younger, weighed 850g. It was given the colour ring Blue V1 . The decision was made at this point to put a satellite tracker on V0 only. V1 needed a bit more growth and weight. Roy took the 15g tracker and placed it like a mini- rucksack on the back of the bird. The straps were sewn together with cotton so that in a few years they will disintegrate and the tracker will fall off. All done. The chicks were replaced in their carry bags and pulled back up the tree to the familiarity of their nest. As quickly as possible the team re-assembled and, together, walked out from the site. 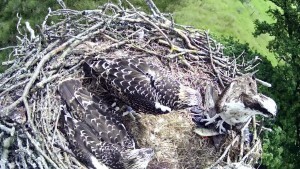 Above, KL and Unring watched the predators move away and within 20 minutes had swooped back to the nest to find their chicks none the worse for their unexpected outing, but like most children, already hungry. No choughs of course, but we are quite chuffed that our engineer has positioned the replacement close up camera to give us the view our chicks have over the rim of the nest. An inadvertent sneeze or cough close to the edge could spell disaster, with nothing to crow about then! Luckily, KL and Un-ring are still bringing in sticks to keep the lip of the nest well raised and stop any dizzy desire to see the green grass at close quarters. The chicks are five weeks old now and well covered with feathers, although the wing and tail quills have quite a bit if growing to do before they can take that one way step in about 3 weeks time. 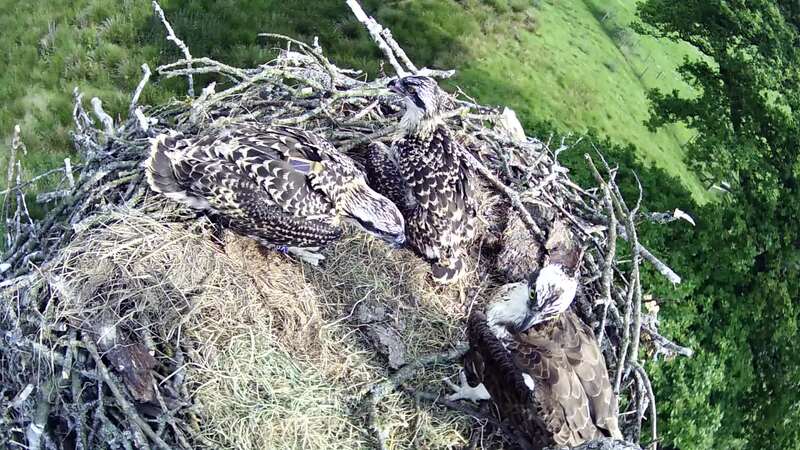 To get some sense of perspective from their static position in the nest both young birds are regularly ‘triangulating’, staring hard at a fixed point and then bobbing their heads in quick side to side motions to get an idea of the distance and dimensions of the object in view. With their eyesight being about 8 times better than ours even beetles will be in perfect focus. Number 14 returned to Cumbria on Wednesday morning, crossing the county to the west of Kirkby Stephen. After a journey of at least 10,000 miles to Africa and Europe he has gone to see his relatives in Northumberland. 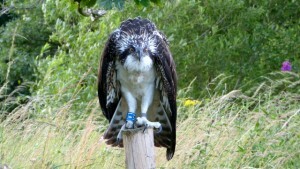 Lake District Osprey Project; He’s Back! 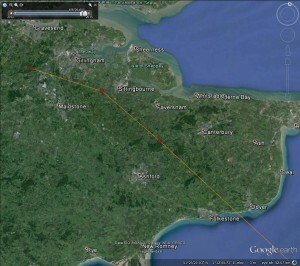 Number 14 crossed the English Channel between Calais and Dover on Monday afternoon. 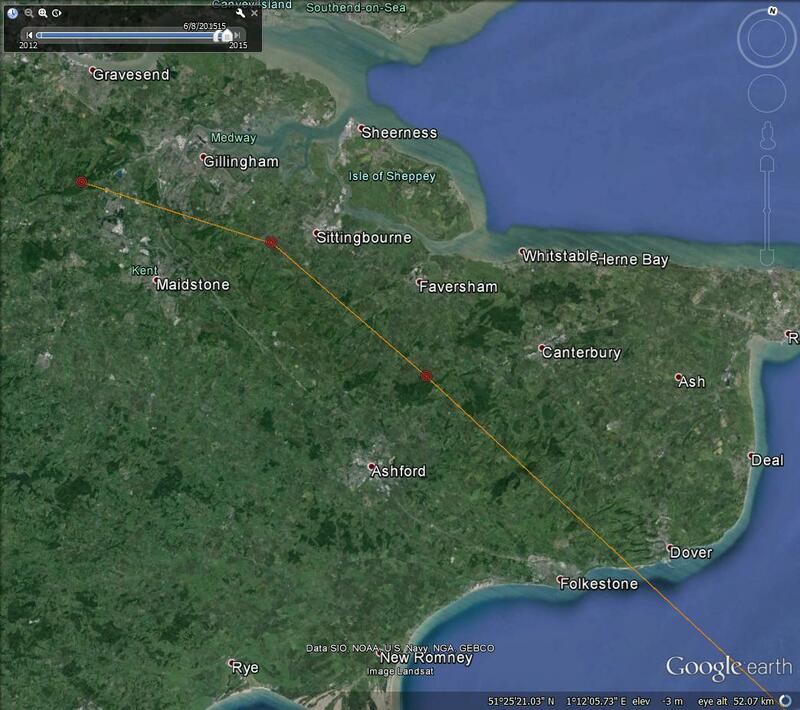 He then headed in a north-westerly (good direction) direction until 8.00 pm. 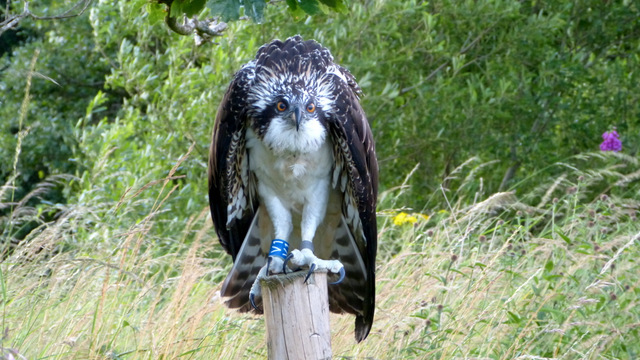 If you live near Great Buckland in Kent and saw a strange bird sitting in a tree eating a fish do let us know, meanwhile if you are an interested bird watcher and see an osprey with a small aerial on its back, likewise. For all those country counters Number 14 has now reached thirty countries visited – Luxembourg. Where will this bird turn up next ? Rutland Water?, Bassenthwaite? Wimbledon? Watch the skies as well as this space!